Macau has been far more protective of its colonial heritage than Hong Kong and, for the most part, the churches, squares and government buildings constructed by the Portuguese are still standing throughout the city. Most of the best Portuguese Macau sights are clustered around the Largo de Senado and can all be visited in under three hours, with a further hour or so needed to visit the Dom Pedro Theatre and Moorish Barracks. Directions, where necessary, are provided in italics and you can grab a map from the Macau Tourism Office on Leal Senado, where the tour starts. Once the heart of Portuguese power in the city, Largo do Senado, or The Square of the Senate, is covered in decorative mosaic cobbles and banked by grand buildings covered in shades of pink and yellow. The square is almost head to toe colonial Portuguese and if you squint your eyes you could almost be on the Med, not in Macau. If you want to see Macau’s Portuguese, colonial legacy, this is the place to bring your Kodak. The centerpiece of the square (and the city), is the Leal Senado, a white washed building with wooden, green windows, wrought iron balconies and flowers hung across its façade. Built in 1784, the building was where the Portuguese plotted their conquest of Asia. It wasn’t to be, and today the building houses the Mayor’s Office and a public library. The whitewashed, neoclassical building on the east hand side of the square is The Holy House of Mercy, a charitable, church organization since its inception in the 16th century. Despite its divine mission, the building itself hasn’t always been a home of praying and piety and the house has served as a refuge for prostitutes and was actually where Macau’s first lottery ticket was sold – for charity, of course. Today it’s home to a small museum commemorating the Society’s charitable works in Macau, including the skull of its founder, Dorn Belchior Carneiro. Perched at the north, western end of the Largo do Senado, on Largo de Santo Domingos, St Dominic’s Church is a graceful, pastel yellow building with tall, green, wooden shuttered doors and windows that are flung open during services. The church offers services in Cantonese, Portuguese and English and remains a major meeting point for Macau’s sizable Christian community. At the back of the church, through the wide veranda, is a small museum with an extensive collection of sacral art from both Macau and Portugal. Some of the pieces stretch back to the 16th century and include paintings, religious artifacts and a variety of statues, several of which look like they’ve been lifted from a Best of Kitsch convention. From the church, take Rua da Pahla, turning into Rua Sao Paulo to reach The Ruins of St Paul's. Undoubtedly Macau’s blockbuster tourist attraction, St Paul’s is the ruins of a 16th century Jesuit church, which many believe to have been the most important church in Asia during Christianity’s early forays into the region. The church was almost wholly destroyed by fire in 1835 while being used as a barracks, and all that remains is the remarkably impressive façade. Set in stone, the four-story façade is held aloft by slender columns and adorned with intricate carvings of biblical scenes, saints, and more Asian-inspired images. At the top of stairs, to the right St Paul's facade you'll find the escalator to the Monte Fort. Look for Macau Museum signs, which is built into the fort's foundations. As a Christian stronghold in a distinctly un-Christian neighborhood, the city’s early Jesuits was constantly concerned about invasion and having their heads chopped off by nonbelievers. In 1617 they began construction of the Monte Fortress, a stronghold that would eventually cover over 10,000 square meters and was designed to withstand a siege of over two years. The fort didn’t see much action over its lifetime and the cannons were only fired twice in anger, once when, instead of rampaging pagans, a Dutch fleet arrived to invade the island. Seriously outmanned and outgunned, a Jesuit priest, apparently in retreat, fired one of the canons by mistake. Fortuitously he struck the Dutch gunpowder ship, blowing it and half the fleet into the sky and saving the island at the same time. You can now stroll around the restored fort and its underground corridors cut into the rock face. You've completed the first half of the tour, ticking off most of Macau's most important Portuguese sights along the way. However, if you want to see the Moorish barracks, which is highly recommended, along with a number of other interesting sights, retrace your steps back to the Largo Do Senado, cross Aveinda de Almeinda Riberio, walk east from the Leal Senado, before turning south onto Rua Central. You'll find the Dom Pedro Theatre on the right-hand side, on Calcado do Teatro, after walking less than 500m. Unable to understand Cantonese, Macau’s Portuguese population spent years in the cultural wilderness, with only the local library and mass on a Sunday to keep them distracted. More lively entertainment arrived in 1860 via the Dom Pedro Theatre, which included a bar, restaurant and pool room along with its auditorium. Restored after years of disuse, the theatre has classic colonial arcades surrounding it and a grand, three arched entrance, all swathed in a somewhat sickly green pastel color, bordered by white trimming. Return to Rua Central, continuing south, where the street will become first Rua de Sao Lourenco and then Rua da Barra, from where it will open up onto Largo do Lilau. Arguably Macau’s most quintessentially Portuguese square, Largo do Lilau may lack the grandeur of Largo do Senado but the cluster of low rise, almost cottage-like houses that bank the square and streets surrounding it, decked in pastel tones and featuring wooden shutters, are an authentic slice of small town Portugal in the heart of Macau. 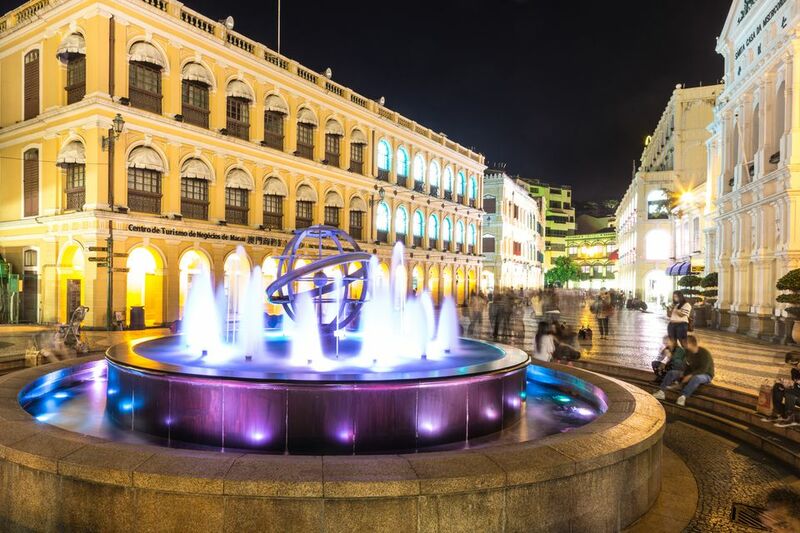 It’s said that if you drink from the fountain at the heart of the square, you’re sure to return to Macau. Continue along Rua Barra to find the Moorish Barracks. Macau was just a link in the chain that was the Portuguese Empire, stretching from Goa to Malacca to Macau. In the late 1800’s the Portuguese dispatched a garrison of Indian police to the territory, housing them in a specially designed, Moorish-inspired barracks. The building molds together Portuguese, Indian and Moorish influences, the latter best seen in the horseshoe arches that hold the barracks' wide verandahs and the turreted roof. The building is now home to the city’s Maritime Authorities and is off limits, but you are free to wander around the exterior. Is Macau Part of China? What Are the Top Four Macau Hostels? Do You Need a Visa to Visit Macau?